After a false start on 19th January when I was supposed to be running the Endurance Life www.endurancelife.com Coastal Trail Series Anglesey Ultra, but this got cancelled due to the snow, I finally made it to the start line of my first Ultra with hubby in tow. 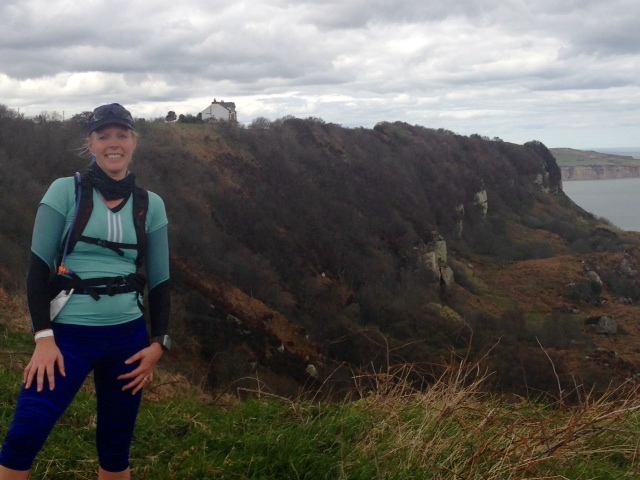 34 miles around the North York Moors. Of course there was the option of running a 10k, half marathon or the marathon, but not for me! We made a weekend of it by heading off Friday afternoon from Manchester and stayed at a fabulous B&B in Whitby, http://bensonsofwhitby.com/ who were superb in organising our porridge breakfast for the ungodly hour of 6am without hesitation. To the start line, it was a 7am registration, after running big name marathons this in itself was a shock to the system by the simplicity of the whole registration and start. It was a refreshing change though. There were 39 of us that started, even one with a dog! The Marathon got underway at 9am, half marathon at 10.30am and the 10k at 11.30am. The first section was a gorgeous run along the cliff tops of a 6.9 mile loop that we would revisit again as our last stage. We were all flying along there, not even noticing the stairway to hell (more on that later! ), even with me stopping for an impromptu toilet stop in the bushes courtesy of my pre-race nerves. I remembered to down a Clif Espresso Shot gel at about 5 miles, just after CP1 at 4.8miles and just before 3 others & I (including hubby) took a wrong turn having to run an additional ½ mile and losing about 15mins in faffing around trying to figure out where to go. At least we figured out where to go, some poor runner ended up in Scarborough and needless to say did not finish the race, probably just had Fish & Chips and a taxi back to Ravenscar! We found out afterwards that some local funsters had pinched the directional signage 3 times already, little nutters, lets make them run 34 miles and see how funny it is! Anyway back on track and having to overtake a big group of runners that we had all just passed 1/2hr previously was pretty demoralising and mentally draining to say the least. This loop took us back past the start where the half marathon and 10k runners were all milling about waiting to start, so that gave us all a bit of a push from their cheers and encouragement. The course then took us north up through Robin Hood’s Bay and the views were absolutely stunning and the hills unrelenting, particularly through Boggle Hole. I tried eating again at 10miles with 2 bites of a Clif bar, which was all my stomach could manage, I must get better at this eating whilst running business. Being such a great weather day there were a lot of walkers out giving out lots of encouragement and keeping well out of the way. CP2 was just at the edge of Robin Hood’s Bay at 13.3miles which we passed again after a ‘quick’ loop around up a rather unforgiving hill! I did try eating again up this hill, taking advantage of walking, with a cheese & ham roll, again I managed 2 or 3 bites before giving this to the seagulls to finish off! Just under 5 miles later I was at CP3, which was listed as 18miles in, however my Garmin was showing 20, this worried me as I didn’t think we had gone that far off course earlier, but now started to think this was going to end up a 36mile race which was not a positive thought! Chatting to another runner, his watch was half a mile less than mine, so I was pleased to see that. By this stage the marathon and halfers were scattered amongst us all which provided some more conversation and helped kick me along. I got chatting to one half marathoner who was already in agony stating he was pleased it was only 4 miles to go! I just agreed and plodded along until he asked me what distance I was running. He was then in awe and asked if he could run with me until the finish to pace him, I agreed but said I’d be lucky to keep up with him! However I dropped him along the moors and didn’t see him again. The run along the moors was beautiful but tough, my energy was waning and it was a walking shuffle jog, is that a technical description? I thought I had better try eating something again and managed half a salami stick, which tasted surprisingly good! It actually gave me an energy boost too, I’ll be using that again, they are so light too so easy to carry. I’m glad I had my next energy wind as I then passed hubby at the marathon finish line, who’d pulled out after the marathon as he had been sick across the moors and it just wasn’t going well. I agreed to keep going and would see him soon I hoped! It was back on the loop now for the last 6 odd miles to go through. This was an up and down loop emotionally as well as physically, the stairway to hell I mentioned earlier was nearly the end for me, I was in so much pain for them I had to go down them sideways one step at a time leaning on the bannister and the uphill back out the other side of hell wasn’t much easier! I was also worried about taking the wrong way again, but needn’t have worried as this time CP 5 was located there. What a saviour! Managed some water there and half a bourbon biscuit and back on the disused railway line for the last 2 miles to the finish. I caught up with number 325, Iain Denby, at CP5 and we walked/ran the last bit home. Hubby had recovered enough by then to meet us about a mile from the finish and walked/ran back with us as well which was great. Gone were the adoring crowds of the finish line, but I clocked out and got my finishers dog tag and were were off! I can’t believe how well I pulled up the next day, felt much better than after Manchester Marathon 6 days prior. I was even walking down stairs the right way, and 2 days after the race was back on the bike, and running on the 3rd day! 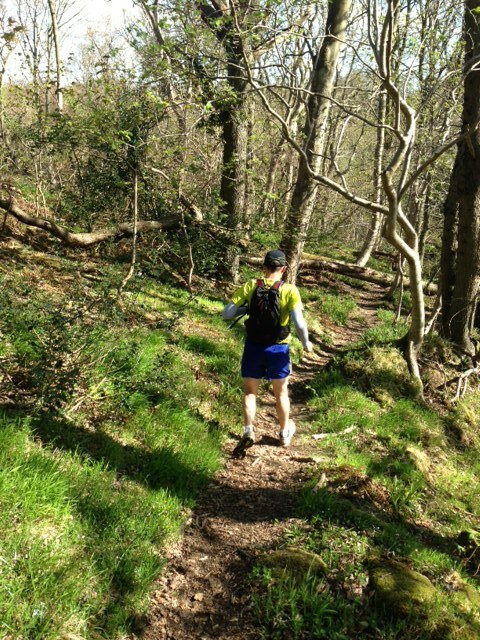 I think this was down to 2 reasons, trail running is much softer on your joints and muscles, although some different ones in my ankles & calves ached from the uneven terrain, and of course you run differently, its not as fast and there is some walking (in my case at least…..as well as for many others). 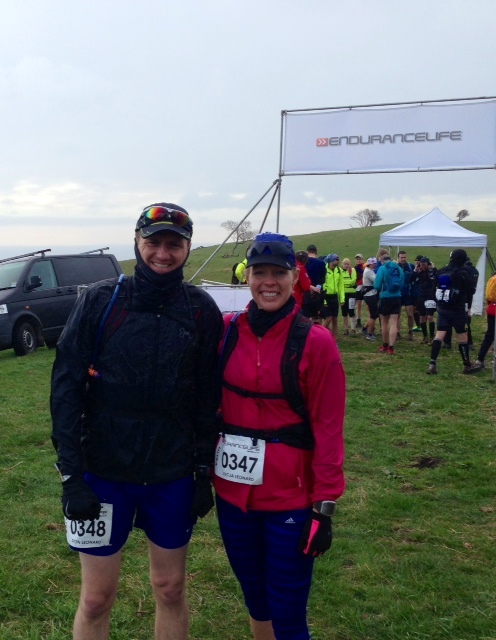 I was stunned by the scenery and loved the whole run, the experience and the fact I am now an Ultra Runner. 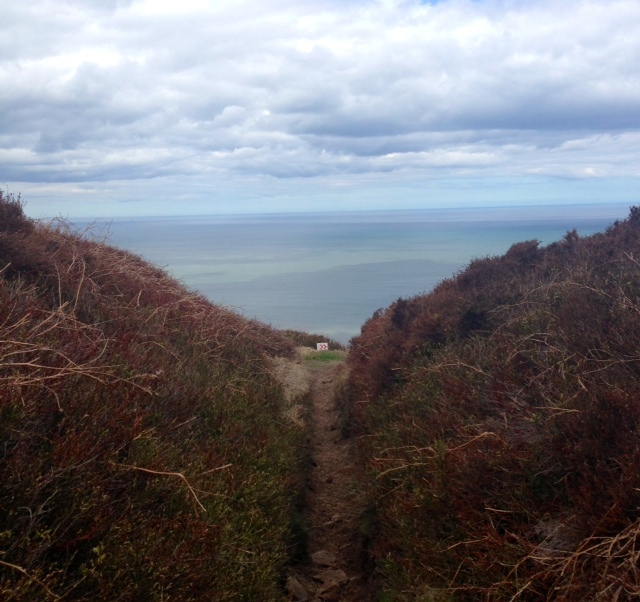 Look out North York Moors, I will be back! Now this run was a test for both of us, and after much debating, we have decided to really challenge ourselves to complete the Kalahari Augrabies Extreme Marathon www.extrememarathons.com . Our challenge is to run (walk or crawl) 250km (155 miles) through the Kalahari National Park (think sand, rocks, gravel, hills, mountains and then some) in temperatures ranging from 40 degrees during the day to 5 degrees at night, over 6 stages taking place over 7 days. With set distances each day ranging from 28km (17mi) to 75km (46mi). It is a fully self sufficient race, so we have to carry all my own supplies to survive, including all our own food & compulsory survival kit. So stay tuned, there will be many a training run between now and then! Good luck for Saturday! I’m sure you’ll be ace! Congrats on finishing you first ultra! I did my first at Northumberland, had the same experience as you – my legs were surprisingly good the next day. Good look with the Kalahari race – think I’ll have to add your blog to my bloglovin list to follow your preparations, I love reading about these kind of events, and this one sounds like a challenge! Thanks glad you enjoyed it. Big preparations now. 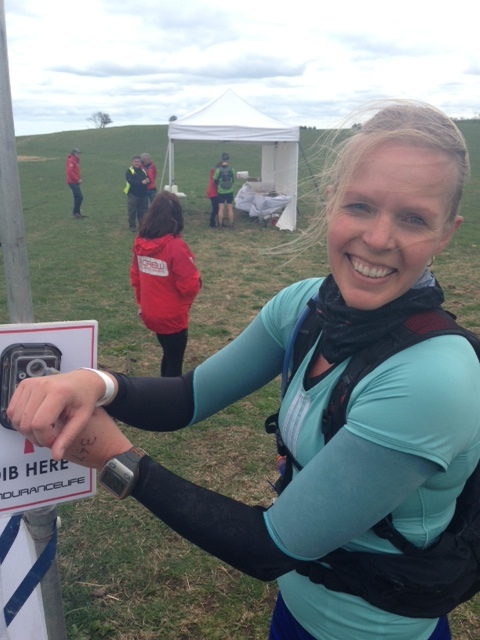 Congrats on your Northumberland ultra! What’s fabulous achievement!